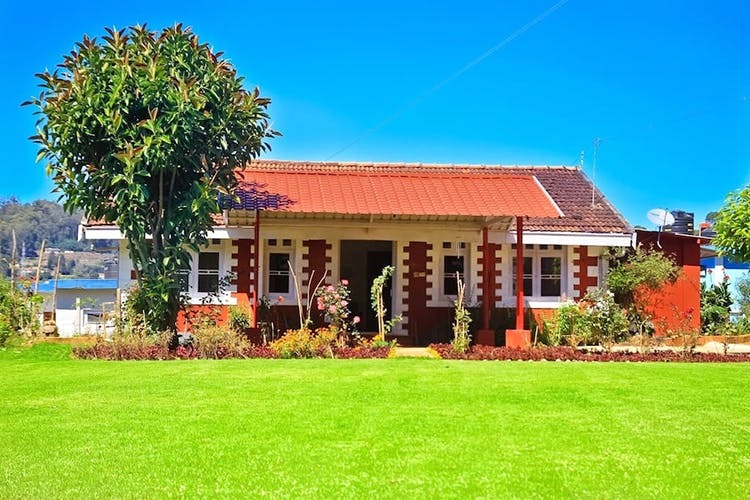 A quaint colonial-style cottage nestled in the Nilgiris Hills, Turret Heritage Cottage with old-world charm, rose gardens and WiFi, is a a dream vacation spot, away from the city. It might remind you Mayo Hall, but the brick red building of Turret Heritage Cottage’s connection with Bangalore’s civil court ends with the red paint and colonial-era inspired architecture. The bungalow is peaceful, pleasant, and perfect for a quick weekend getaway from Bangalore, come rain or shine. With three bedrooms that can accommodate a maximum of six guests, the entire family can check in. Or you could check in with your SO. Ensuite bathrooms with twin, queen, or double beds, make it ideal to head to with friends too. And for all you city slickers, there’s WiFi. There is a common room with stately furniture and period decor for you to lounge around, do a catch-up sesh or even game nights. If you’re not too keen on heading into town for each mean, a well-equipped kitchen will help you sort out coffee, Maggi and snacks, while breakfast comes complimentary. Extra meals, both vegetarian and otherwise, can be ordered in advance thanks to the bungalow manager who’s always around to help. Known for wonderful gardens, Ooty is no stranger to roses and flowered pathways. This cottage is no different. In fact, this one has a wrap-around garden to saunter in and catch the sunset. Be sure to stop and smell the roses, as the caretaker will tell you they are award-winning roses that won the first prize for the best private rose garden at the Ooty Flower Show 2018. If casual walking isn’t your think, play around with the three adorable pooches who are perfect to cuddle with when it gets cold. Or play fetch, they love it! If you are planning on exploring Ooty township, the hosts can arrange for transport to hit up all the major tourist spots including the historic St Stephen’s Church and the Doddabetta Peak. In fact, they’ll even organise golf outings, tea estate visits, and offbeat activities too. Just make sure you let them know in advance.